It is a very fortunate thing, for those to whom getting to know the music of J.S. Bach better is close to the heart, that posterity has in its possession copies of many of Bach's works in preliminary versions, quite unlike the versions upon which he eventually put his stamp of approval. Only through comparison can one really begin to appreciate the way that the man worked, how he thought through his music, and what kinds of decisions he made and later unmade as he trudged through the sometimes long and arduous process of composing a piece of worthy music. The Prelude and Fugue in G minor, BWV 535 is one such multiple-version-surviving piece. 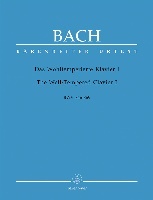 BWV 535a, the early, very different, and incomplete version of the work, is thought to have been composed sometime before Bach took the job of organist in Weimar (before 1708); the final version, BWV 535, is almost certainly a product of those Weimar days and, thus, might well be separated from its predecessor by as many as ten or 12 years. 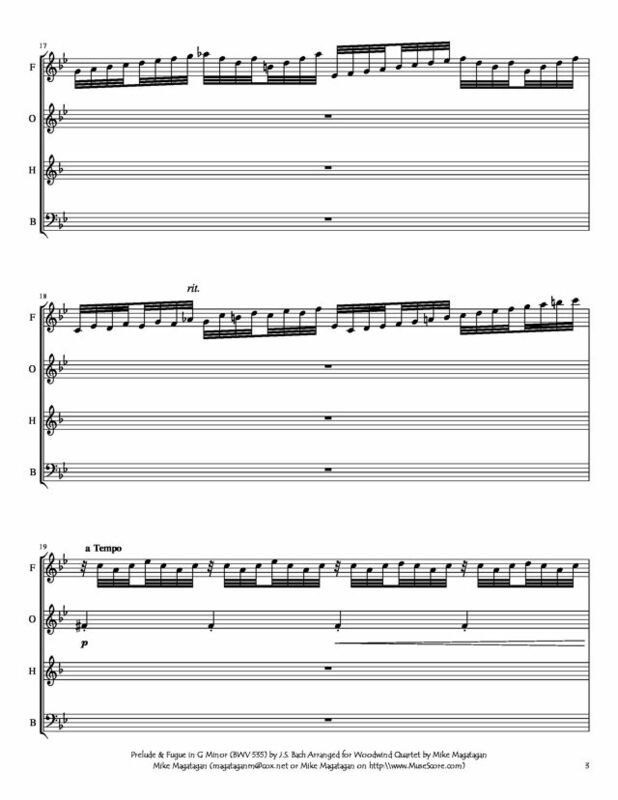 As it stands in its final version, the Prelude of BWV 535 is a florid, flexible 43-measure mock-improvisatory essay, a series of seamless and propulsive arpeggio figurations separated from one another by brilliant scales and rounded off at the end by a paragraph of thick imitative polyphony. The early version is, on the other hand, quite a different beast: It begins with nearly the same two-measure burst (a few notes have been tinkered with), but then takes shape as a smaller and less electrifying series of phrases that never move away from G minor and never achieve any real momentum, though the middle two phrases, with their buoyant and incessant dotted rhythm, have an undeniable charm to them. 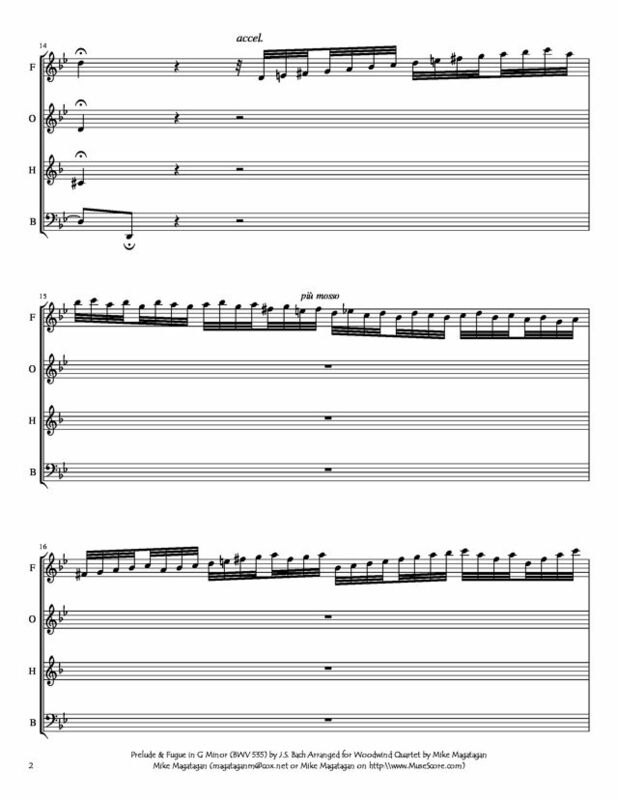 The Fugue of BWV 535a, the early version, never made it past its 65th bar. When composing BWV 535 proper, Bach took up these 65 original bars of music and subjected them to a number of superficial alterations: the contrapuntal framework remains unchanged, as does the subject itself, but a number of rhythms and notes are changed here and there, and a few measures were almost entirely rewritten in order to better get from point A to point B. He added 12 more bars to finish off the last subject statement (in the pedals, which had broken off in mid-stride in BWV 535a) and provide the usual showy, cadenza-like coda. One additional interesting change might be noted: In BWV 535a, the G minor key is notated in the old manner, a single flat in the key signature, while in the finished BWV 535 of a decade or so later, Bach adopts the more modern two flat key signature for G minor. 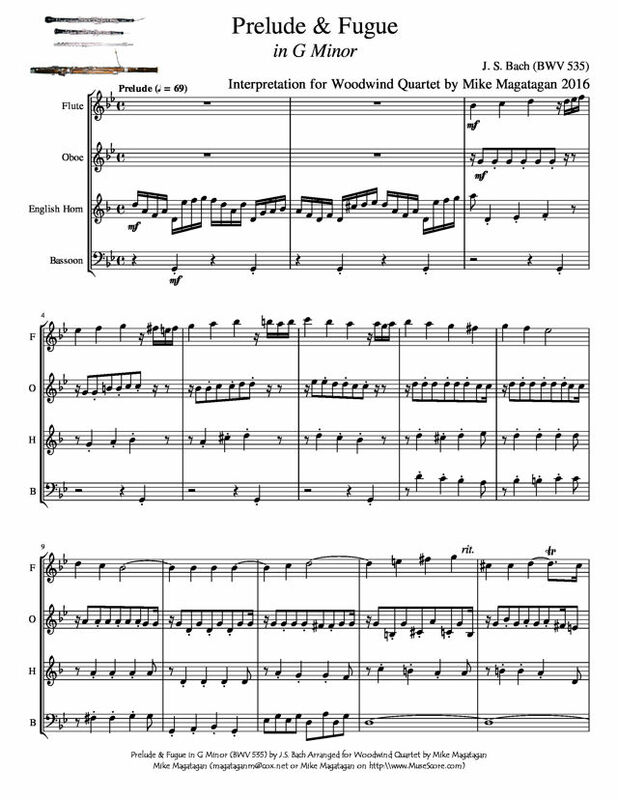 Although originally composed for Organ, I created this modern intrepretation for Wind Quintet (Flute, Oboe, English Horn & Bassoon).